The USB2DVIE3 USB DVI Video Adapter offers a perfect external multi-monitor solution, enabling you to add a high-resolution (up to 1920x1200) external DVI output to your desktop or laptop computer system using an available USB 2.0 port. 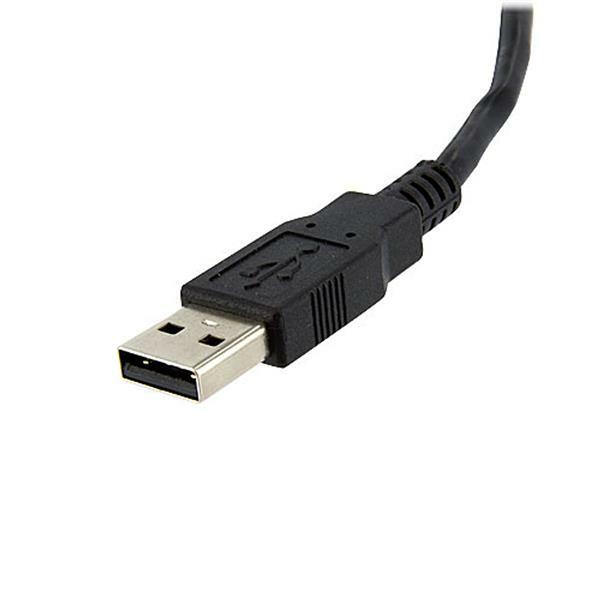 A cost-effective solution for systems that lack the outputs required for a multi-monitor setup, this high-performance USB to DVI adapter can be used to mirror your primary display and show the same image on both screens, or extend your desktop to double your workspace. 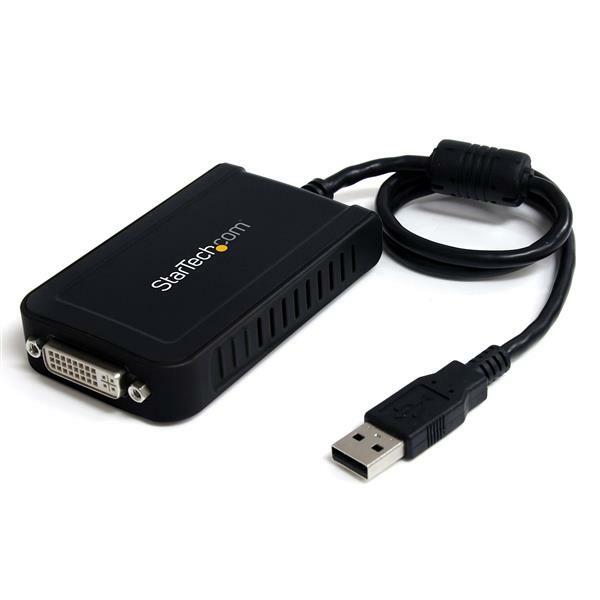 This small form factor USB video adapter can be used with up to 4 additional (5 total) USB2DVIE3 USB video adapters, creating multiple DVI connections to add additional displays quickly and easily - all without having to open the computer case to add extra video cards. Just installed 2 USB2DVIE3 adapters on a HP laptop. Looked good at first - set the proper transition from monitor to monitor for the 3 displays monitor -laptop - monitor. Mouse arrow suddenly disappears on the side monitors. Reappears when the usb adapter is disconnected and reconnected, but after a couple mouse transitions the arrow disappears (right click's work, but no arrow) on the two monitors on the Startech adapters. Thanks for sharing this feedback with us. We suspect this may just be a display arrangement or driver issue. We would be happy to look into this problem with you. Please feel free to live chat or call us so we can look into this. We've also emailed you directly about this situation. We hope to hear from you soon! Worked out of the box form Windows. Really great! When booting into Ubuntu though it does not respond and I can't find any drivers available. Thanks for sharing your review of our USB2DVIE3. We're sorry for any confusion, we list the supported operating systems on our Technical Specifications. This model is designed for Windows only. Our USB32DVIPRO is supported in Ubuntu 14.04, and 16.04. If using one of those Linux distributions. Thank you. This product worked great to set up a second monitor at home for my work from home job. I was please that it was easy to set up and a quality product. At one time the screen froze but I unplugged and re plugged in and the problem solved quickly. I was sent this item for free in exchange for an honest opinion. Hands down a breeze to connect and makes my job much easier. I'm pretty satisfied with the adapter, but I do want to note that I received the adapter as a free sample. I think it's pretty self explanatory to set up, but the length of the adapter could be longer. For the most part, the adapter served its purpose, but there were a few times where I experienced display issues! I was pleased with the adapter`s performance. I should mention that I received a free sample of this item to review. Installation was simple and the 2nd monitor worked fine. The USB connection was an easy way to add a 2nd monitor, however this did mean I had one less USB port to use for other things. I also wish the USB cord was slightly longer to allow more options where to place my computer and monitor. Overall I was happy with this adapter, but wish it was also compatible with Mac. I received this adapter for free in exchange for my honest opinion, and it was just what I have been looking for. At work, we use up to 3 monitors at a time and with just a laptop at home, I could never really take advantage of our work-from-home option, as switching back and forth between windows is next to impossible for our projects. After receiving this adapter though, I can happily say that my work week is much less stressful now that I have the freedom to work from my home computer. It was very easy to install the drivers and I have not had any issues thus far with performance. It brought up a perfect 2048x1800 display on my second monitor and has remained stable and reliable. (5 stars) Never had a single problem with it. I use this device at work, connected to a docking station that shares 4 users. None of us have any problems. Very happy with it. Super little device to cheaply give you a 2nd screen, newer PC's might have display ports, but until then this is great. Very occasionally a browser window from one screen may jump to the other on my w7 machine. I'm not sure what clicking the "fixed position" mode does on the software that came with it. I will buy more for other PC's & laptops. Got this for a client who wanted a 3rd monitor on his laptop for sticking outlook on. It's a USB monitor adapter so you can't expect to do anything fancy.. works fine. The install took about 2 minutes and worked properly right away. Why this company would make only some of their products available for Mac and then some not is beyond me. Thanks for your feedback. Since not all of our products are currently compatible with the Mac OS, we recommend checking the Technical Specifications section on each product page under OS Compatibility, or contacting our Tech Support team. 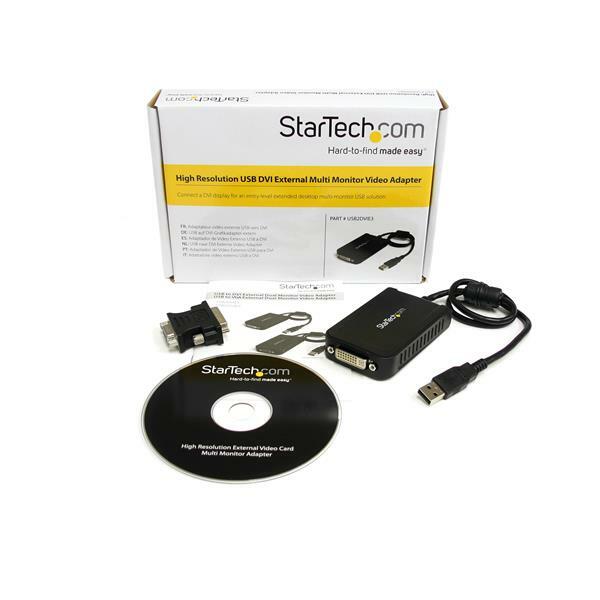 If you're still looking for a USB to DVI adapter that's compatible with Mac OS, you might want to check out a similar product - our USB2DVIPRO2 (www.startech.com/USB2DVIPRO2) as an alternative.